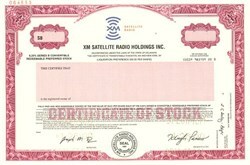 Beautiful engraved SCARCE specimen stock certificate from the XM Satellite Radio Holdings Inc dated in 2000. This historic document was printed by United States Bank Note Company and has an ornate border around it with a vignette of the company logo. This item has the printed signatures of the Company's President, Hugh Parsons and Secretary and is over 13 years old. 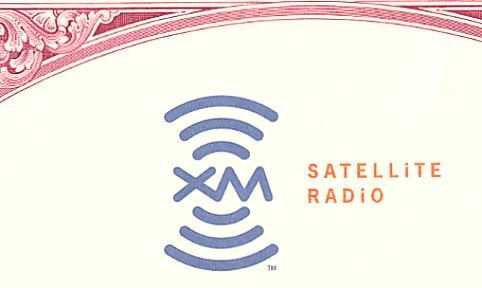 XM was founded in 1992 as American Mobile Radio Corporation and was owned by American Mobile Satellite Corporation (SKYC). XM Satellite Radio Inc., an emerging force in broadcasting, was incorporated in 1992 and is a wholly owned subsidiary of XM Satellite Radio Holdings Inc. XM is publicly traded on the NASDAQ exchange since October 5, 1999. XM's founding was prompted by the radio industry's first major technological change since the popularization of FM radio in the 1970s: the creation of a third broadcast medium, transmitted by satellite, now taking its place alongside AM and FM on the radio dial. One of only two companies with a license for this new national audio service, XM has assembled a "dream team" of creative radio professionals and a management team committed to leading the world into the next generation of radio. XM transmits 100 discrete, nationwide radio channels to subscribers throughout the continental U.S. in digital sound from coast to coast.